On 26th July 1914 Edmund Lenfestey (Le Bordage, St Peter's) joined No.1 Company of the Royal Guernsey Artillery as an eighteen year old. Eight days later England declared war on Germany. On 20th November 1915 Edmund with his friends, John Corbin (Le Douit, St Peter's) and Clarence Tostevin (La Couture, St Peter's) volunteered for active service and joined the Royal Field Artillery. In January 1916 about forty Guernsey volunteers left for Swanage where Edmund and his friends spent two and a half months training to man 4.5 inch howitzer batteries. They were then sent to Woolwich, the headquarters of the Artillery, before being ordered to France. Crossing from Southampton to Le Havre, they disembarked and marched for two hours to Harfleur on a cold and wet day in March 1916. "During the eight days in Harfleur we occupied our time in gun-drill and fatigues down at the docks, feeding only on bully and biscuits. We were now only twenty Guernseymen amongst thousands belonging to different regiments. .....the three of us were split up, one in each division. John was sent to the 2nd Division and myself to the 7th Division. Clarence stopped behind with a rash. Wished John au revoir at Rouen, not to see him again for 18 months." The 7th Division* captured Mametz, a success on 1st July 1916 in contrast to the disasters North of and along the Albert-Bapaume road. There were further successes for the Division during the night attack of 14 July. "Some of us disentrained at Morlancourt on the river Somme and I was posted to the 35th Howitzer Battery, 22nd Brigade. I was now a lone Guernseyman and had to make myself at home in the battery, being the only Kitchener's man amongst regulars. My battery was in action at Bray-sur-Corbie firing on Mametz. The horses and wagons were stationed at Sailly-le-Sec. After being rather quiet, only firing a few shells a day, we got ready for the big advance. The British started the offensive on a wide front on 1st July at 5.26am. We bombarded for two hours with ceaseless firing covering our infantry as they went "over the top" The infantry captured all objectives though suffering heavy casualties (the 7th Division had 3410 casualities on the first day). Thousands of German prisoners passed quite close to our guns two miles behind the front line. After this advance we stood by all night and day for fear of a counter-attack which eventually came. At that time we had only one casualty, a lad killed outright. Our six guns advanced to Mametz Wood (10th July), passing through villages completely destroyed by our shells, including Fricourt. Another four weeks firing night and day, for we were pressing the Germans back, and then the 7th Division retired from action for a fortnight's rest at Heilly near Corbie. 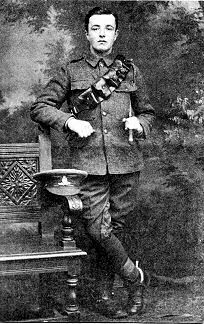 This was the first fortnight of August 1916 and there I had news of my father's death."